If you&apos;re looking for a business plan template to jumpstart your plan, you&apos;re in the right place. LivePlan&apos;s dynamic template walks you step-by-step through the planning process. With simple fill-in-the-blank inputs, simple but powerful financial forecasting, and beautiful business plans, you&apos;ll go from template to complete business plan in no time. In fact, LivePlan is way more than your basic business plan template. It&apos;s a planning tool that takes the pain out of the entire business planning process. LivePlan helps you track your performance as you grow, define the tasks you need to get your business to the next level, and even lets you compare your plan against the competition. No other template comes even close. You could always write your business plan with Word and Excel, but you&apos;ll end up spending countless extra hours figuring out how to get an impressive-looking document. 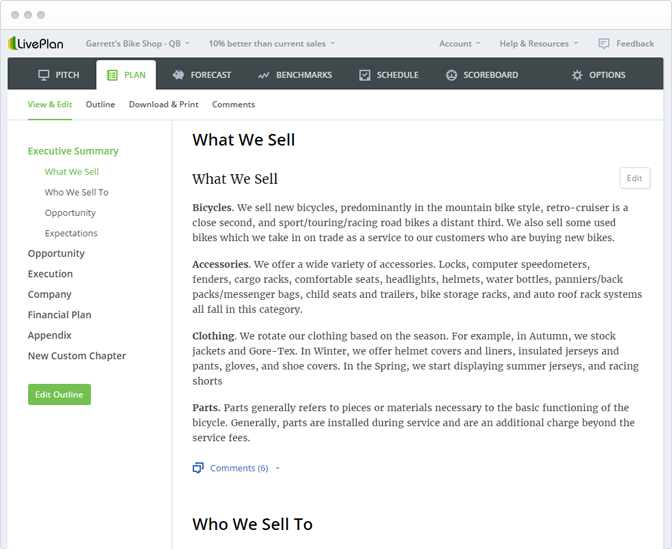 LivePlan&apos;s step-by-step business plan template guides you every step of the way, so you don&apos;t have to worry about formatting, getting the formulas right in some downloaded spreadsheet, or making sure your plan is in an approved format in terms of length and style. Instead of wasting time formatting your plan, spend time growing your business. Building all the right financial forecasts for your business plan can be a lot of work. LivePlan makes it easy with step-by-step forecasting tools. So, even if you&apos;ve never started a business before, you can build all of the financial reports investors expect to see. You&apos;ll get a complete profit & loss statement, cash flow forecast, balance sheet, and more - all without ever having to look at a spreadsheet or worry about breaking a formula. LivePlan&apos;s financial forecasts are guaranteed accurate so you&apos;ll rest easy. Don&apos;t worry about staring at a blank business plan template wondering what to write. LivePlan is there at every step with instructions, examples, and a library of over 500 business plan examples so you&apos;ll never be stuck. LivePlan asks you key questions about your business that other templates skip, helping you build not only a business plan that will impress any banker or investor, but a better business - even if you don&apos;t have a business degree. Don&apos;t worry about complex formatting, or making sure you have the latest charts, graphs and numbers copied from your spreadsheet into your business plan. LivePlan automatically puts your entire plan together and formats it professionally. Choose from a library of template designs and get a professional plan printed in no-time. With LivePlan, there&apos;s no need to email business plan drafts back and forth. Just invite your business partners to your plan and collaborate in real-time on your plan. Don&apos;t worry about working on the latest version and get your plan done faster. LivePlan helps you define your path, run and grow your business with a full set of features to keep you on track. Ready to plan, operate and grow your business? Join 1000s of entrepreneurs who chose LivePlan every day.